The world is poisoned and so are we. To the Wonder: Bracing, like a convertible ride on a cold morning in France. 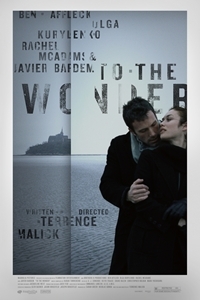 "Why do we come back down?” asks Marina (Olga Kurylenko) in Terrence Malick’s To the Wonder. Why, after mounting to transcendence, do we sink back willy-nilly into everything we sought to transcend? To take an example from the film: why, after we ascend into an otherworldly realm like the island abbey of Mont Saint-Michel, do we wind up tromping through the unstable muck that surrounds it? Well, because we’re human. Even if we believe are made for Heaven, we must make our home on Earth — whether that’s France, where Marina lives with her daughter, or Oklahoma, where she goes with her new lover Neil (Ben Affleck). Both places offer the wonder that the title mentions. France has gardens and cathedrals, Oklahoma has prairie sunsets and the neon brilliance of a Sonic burger joint. But both places are also stuffed with the deadening weight of the everyday. Tellingly, not a single glowing screen appears in the film: no TVs, no smartphones, no tablets. In short, no distractions from real life and the (wonderful, awful) real people we encounter. On top of that — or maybe, rather, below it, adding ballast to our earthbound selves — there is something amiss. The world is poisoned, and so are we. Affleck spends his time investigating fouled rivers and toxic dirt, but that’s not the point of the film. Like almost every exterior Malick shows us, it’s just a sign, pointing to the interior landscapes of his characters. It’s Affleck who is poisoned: the river of love that ought to flow to Marina is choked, dammed, diverted. And Marina, damaged by the failure of her first marriage, is herself closed off: if children are the fruit of love, she has taken steps to remain fruitless. How to dramatize such an interior story? How to convey restless souls with a minimum of dramatic actions? Malick takes two approaches. First, he makes the camera move. It’s not shaky, but it’s rarely still, and when it is, it’s only for a few seconds. Neil is a stone slab of a man, but the cinematography sends Marina beating against him like waves on a cliff. Second, he gives us a man whose exterior life is devoted to care of the interior: a parish priest, Father Quintana (Javier Bardem). As a preacher, Quintana can talk about the transcendence demanded by love even as he fails in his own search for the divine. And as a minister, he can show that perhaps the best way to search for wonder that endures is to roll up our sleeves and dig into the muck. Of course, this being Malick, nothing about To the Wonder is quite so straightforward as I may have made it seem here. Some may find its allusive, elusive character frustrating, or even obtuse. Others, myself included, may find it a respectful, even reverent approach to the mysteries of love.